While it may seem like your home's air ducts should be just fine on their own, there are many different issues that can occur over time that lowers their ability to function as well. It may break or have a disconnect in the duct occur eventually, rodents or insects may try to live inside of them, and even just the dust that gets pulled in and builds up with time is enough to cause issues if it isn't cleaned out. Not only can these things cause health troubles for your family thanks to lowering the air quality, but it also winds up increasing your energy spending over time. That's why it's important to check for issues periodically and get them taken care of as soon as possible if they arise. Pay attention while the air conditioning or heat is running in your home for any odd sounds coming from the walls. Things like whistling, low wavering noises, or even clanging. 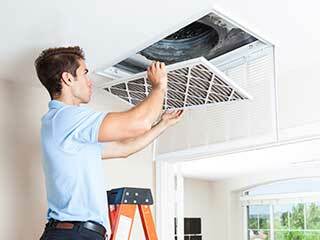 Anything along these lines may mean that a break has occurred in the duct and is allowing air out of it so it'll have to run longer to fully reach through the entire household properly. It may also pull in stale air from closed off parts of the house that may have mold in them, so it's best to get it tended to right away. There are several indications of pests living in the ducts of your home, one of which is if you notice a foul odor coming from the vents, particularly when the air is running. This can come from the waste of rodents, or even cadavers if they got trapped. You may also see signs of insects in the form of husks and parts around your vents, or inside the duct if you can pull the vent out and look. Droppings from rodents may also pop up. If you notice that the vents around your home are choked up with debris, it's highly likely that your ducts are suffering the same issue.